The Segment route type allows for matching the route string against one or several URL path segments. If you look at the module.config.php file, you can see the Segment route type is used inside of the "application" route to make actions of your IndexController automatically mapped to site URLs. You just add an action method to your IndexController class, and it becomes available by a URL like "http://localhost/application/<action>". For example, you can see the About page of your site with the following URL: "http://localhost/application/about". To demonstrate the creation of the Segment route type, let's implement a controller action which will generate a simple barcode image. Barcodes are widely used in supermarkets for optically recognizing goods in your shopping cart. 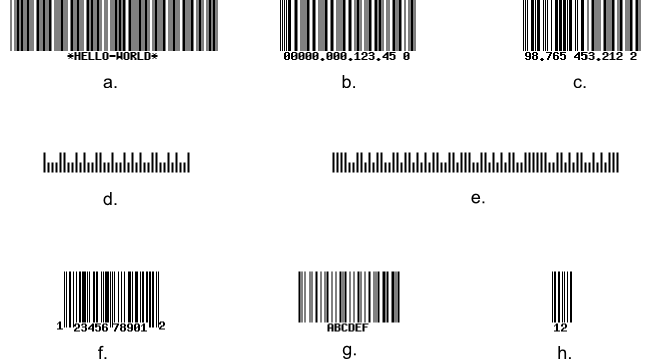 The barcodes may be of different types and have different labels. We will use the Segment route type to map the action to a URL like "http://localhost/barcode/<type>/<label>". After installing the extension, restart Apache to apply your changes. Segments of the route string (line 4) may be constant or variable. You can define the variable segments by using "wildcards". We have three segments: barcode, :type and :label. The barcode segment is constant, while the latter two are wildcards (wildcard's name should start with a colon). You specify how a wildcard should look like inside of the constraints subkey (lines 5-8). We define the regular expression [a-zA-Z][a-zA-Z0-9_-]* which constraints our :type wildcard to begin with a letter and (optionally) contain several letters, digits, underscores or minus characters. The constraint for the :label wildcard is almost the same, but this segment can start with any allowed character (either letter, digit, underscore or minus sign character). Optional segments can be enclosed in square brackets. In our example, we have both the :type and :label segments as optional. In lines 9-12, we define the defaults, the parameters that will be returned by the router. The controller and action defaults specify which controller and action method to execute on route match. // Get parameters from route. // Return Response object to disable default view rendering. In lines 10-11 we get the values of the type and label wildcards from route. We do that with the help of Params controller plugin's fromRoute() method. Analogous to fromQuery() method, it takes two arguments: the variable name and its default value. For generating the barcode image, we use the Zend\Barcode component. In line 14 we define the label text for the barcode. In lines 18-19 we create the Barcode object with the factory method. Finally, in line 23 we render the image file by dumping it to PHP output stream. Zend\Barcode is an auxiliary component used for generation of various barcode images. For additional information about this component, please refer to the corresponding section of Zend Framework reference manual. In line 26 we return the Response object to suppress the default view rendering.